If you’ve seen my last couple of posts, you know that February’s no-spend challenge didn’t go exactly as planned, but we made it to the other side. I shared the story last week (here and here) and now I’ll go into all of the numbers. But first, here’s your reminder to quickly fill out your own Debt Smash-athon Report for February. Our January report was awesome! I can’t wait to see how it all adds up for February. Remembr, we’re counting debt paid, contributing toward your retirement, or saving for a big goal! I’ll report our progress as a group when I get all of the submissions in. 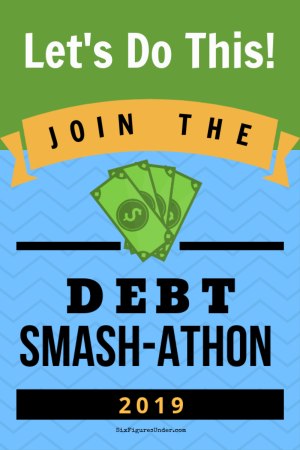 If you’re not already receiving Debt Smash-athon updates, you can sign up here. We live on last month’s income. That means the money that we spent in February was money that we earned back in January and the money we earned in February (which I am about to list for you) won’t be spent until March. This month will be a great example of why I LOVE being a month ahead. Our earnings in February were very LOW for us, as I’ll explain below. I know exactly how much we’ll have to spend ahead of time though, so when we set up the budget for March we adjust accordingly. Contrast that with being part of the way through the month and then suddenly realizing that your income is less than expected and you’ll need to scramble to meet your obligations. Not fun! If you want to see how we track our month-ahead income in the new YNAB, see my step-by-step video tutorial using our real budget. Attorney Income $6,122 Mike works as an attorney full time for the state of California. This is his take-home pay after taxes, social security, health insurance premiums, union dues, and parking fees are taken out. Blogging Income $420 I normally make a full-time income from blogging, but most of my February income (which wasn’t huge to begin with) went to huge blogging expenses. We bought tickets and reserved a room for both of us to go to FinCon in Washington DC this fall. I also renewed several annual subscriptions for online blogging tools that I use. Airbnb Income $149 Airbnb pays you at the beginning of the guest’s stay or, in the case of a stay longer than a month, at the beginning of each 30-day period. We had longer-term guests staying until the end of February, but the payout for most of February was received back in January. This makes a low month for receiving income even though the place was nearly booked solid. Each month we budget last month’s income down to zero. This is how we spent the money we earned in January. Tithing- $1,095— We always pay a 10% tithe on our income. This tithing (like all of our February spending) comes from the money we earned in January. You can read about why we continued paying a 10% tithe even when we were in debt. Fast Offering- $80— Each month we fast (go without food and drink) for two meals and make a donation to help the poor in our area. Mortgage- $3,200 Our mortgage payment includes homeowners insurance, property taxes, and a little PMI. We have a 15-year mortgage, but our big goal is to pay it off in 5. If you’re a numbers person, or are looking at mortgages yourself, Mike has a number-full description of our mortgage just for you. Electricity- $303 The bill we paid in February (at the beginning of the month) covers mostly January’s usage. So that scary upcoming bill I mentioned on Instagram hasn’t happened yet. Car Insurance- $168 We drive two older vehicles (1999 and 2005). We have been so impressed with the service and coverage that USAA provides. We’re able to get insurance with USAA because my father-in-law was in the service years ago. If you, your parent, or your spouse were/are in the military, you’re probably eligible for USAA too! Internet- $70 We still remember what life was like when we moved into our new house and it took six months (and $5,000) to get internet access. We are so grateful to have an internet connection right here in the comfort of our home. Water- $45 Our water bill comes every other month and varies, but we try to set aside half of what we expect the bill to be. Trash- $34 Our garbage collection bill comes every other month, so we set aside half each month. Cell Phone (Steph)- $16 Republic Wireless no longer offers my plan to new customers, but you can now get a 1 GB plan for $20/month. That’s pretty sweet too. It’s what Mike has, but it’s a business expense for him, so never shows up here! Actually when you transfer your number to Republic Wireless right now you can get 2 months of service free! Home phone- $5 Since Mike works at home a day or two each week, we decided to get a home phone for him to use. It’s Ooma, which is internet-based, not a traditional land line. The monthly bill is a minimal $4.50 and the initial set-up (hardware, etc) was under $100. If you want to give Ooma a try, I think that link will also get you a $20 credit. Food- $73 In normal months we aim for $400 per month for our family of 7, but for our February No-Spend Challenge we just budgeted $100. Not everyone includes the food budget category in their no-spend challenge, but since we have a well-stocked pantry and sizable food storage, we decided to incorporate a pantry challenge into our no-spend month. Fuel- $524 Our normal gasoline spending is $350-$400 in a month, but in February we also used $219 of fuel on a trip to Arizona for my grandma’s funeral. Getting all seven of us to Arizona for one-third of the cost of a single plane ticket makes those 28 hours in the car worth it. Houshold Misc- $37 The plan was to have no spending in this category, but we had to get diapers and I forgot to pause/cancel our Dollar Shave Club subscription (see my previous post for details). Clothing- $0 Hooray for a zero! Animals- $45 We have four outdoor cats and about a dozen chickens. The chickens are usually free-range during the day which keeps feed costs (and bugs) down. We bought 32 lb bags of cat food and two 50 lb bags of chicken feed. Allowances- $60 We give our kids “practice money” as a weekly allowance. Each week they get $.50 per year of their age. Fun- $0 More no-spend month success. Don’t worry. We still had lots of free fun in February. For most of our budget categories, we zero out what is left at the end of the month and send it to our mortgage payoff goal, but in our sinking funds we set aside money each month and let it build up until we need it. The amount in bold is the amount that was added to the fund this month. Any spending is noted in the comments along with the current balance of each fund. We do not have separate bank accounts for these funds. All of the money lives in our checking account. I’m not worried about getting the money mixed up because we spend according to our budget category balances, not our checking account balance. We seriously never even look at our checking balance unless we’re reconciling the account. We track our budget categories and spending in YNAB. Medical/Dental- $400 We decided to combine our medical and dental sinking funds from now on. Our insurance changed at the beginning of the year. Our monthly premium is lower, but our potential out-of-pocket is much higher than it was in the past few years. We spent $0 this month. Current category balance is $2,077. Car Maintenance- $300 We spent $20 on new headlamps and oil. Current category balance is $2,137. Christmas- $100 We spent $0. Current category balance is $190. Life Insurance- $75 Our premiums aren’t due until November, but if we put aside this much each month we should be able to cover them (they change slightly each year). Current category balance is $280. Birthdays & Gifts- $40 We spent $0. Current category balance is $164. Car Registration & Smog- $40 We spent $0 from this fund in February. Current category balance is $201. Home Projects- $0 We aren’t actively putting money toward any home projects right now. Current category balance is $706. Family Fun Fund- $0 Formerly referred to as the Kids’ Fun Fund, this is where we put money that the kids earn together. Most of the money comes from the OhmConnect program where you earn money for reducing your electricity during designated hours a few times a week. Current category balance is $314. Trip- $90 We hadn’t planned on putting any money in this category since we didn’t have any trips planned, but it seemed like the most intuitive place to put the motel spending for our unplanned AZ trip (I put the food and fuel in their respective categories). Current category balance is $0. Kids’ 529s $125 — I know that $25 per kid per month invested for college looks piddly, but we’re not super concerned about college costs. You can read about our decision to start saving a little for college in this post. IRA (Steph) $500 — This will max out my $6000 IRA contribution for the year. Mike also has about $700 each month deducted directly from his paycheck into a state pension fund. If you’re new here, our big goal right now is paying off our mortgage. We want to pay it off in 5 years, even though on paper right now it looks impossible. You can see all the numbers and details about our new goal here. In February we put $2,500 extra toward our mortgage principal. This extra payment are on top of the $3,200 normal monthly mortgage payment we make which includes principal, interest, insurance, and taxes. You can get this hand-drawn brick house printable progress chart here. I love that it has LOTS of spaces (365 in total) so that we can color it in often and celebrate our progress! It would work great for paying off your mortgage OR saving for a down payment. Whew! That was a lot of numbers. Thanks for reading our personal finances made public! How did your budget and/or debt repayment go in February!? Any big plans for March? This post contains affiliate links for products or services that we love and recommend. $73 for food – that’s incredible! Wow. Some day, I hope we get to a place where we have enough food stored to do something like that (although, I suppose a starting point would be uh…having places to store said food #smallapartmentproblems haha). Always love seeing your reports – especially how transparent you are about where your money goes! In February, we decided to do something we don’t really do and spend a little money for a change. We went on a little staycation and it was exactly what we needed after focusing so hard on paying back debt for the last few months. It felt strange to spend money on ourselves, but thanks to our debt focus, we were able to make good choices that gave us the most bang for our buck. A staycation sounds like fun! I glad you could enjoy a treat! We’ve stored food in lots of odd places over the years. For a long time we had our bed up on cinder blocks and had tubs of food stored under there! Hi Sue! That’s a good question! We actually keep them all in our checking account. Since we don’t spend according to our checking account balance, but instead spend according to our category balances in YNAB, we don’t have to worry about accidentally spending this money. YNAB guards our money so that spend it on our priorities. pay taxes unless their income is above a certain level, currently around $103,000 a year. I wish I had that problem.) It’s not a lot of money but it’s crazy-stupid I am getting it at all. I even called the IRS to complain. They responded that I’m entitled to it under the law so I might as well take it. We haven’t decided what to do with it yet. It’s always nice getting unexpected money, but seriously, with the current deficit approaching $1 trillion, the federal government isn’t really in a position to start giving handouts to middle class Australian families. Thanks for the new couch or holiday or whatever, Uncle Sam. We are considering that. (The check hasn’t cleared yet, and may not clear for a few more weeks – US banking moves at the speed of a tortoise.) And I know, as far as these things go, that my refund is a drop in the bucket – Amazon made billions and didn’t pay tax, and that’s much more wrong than me getting a partial child tax credit. But I just bristle at the inconsistencies in a system which would allow a person like me, who doesn’t pay tax in the US, to receive a refund. It speaks to a deep dysfunction in the system.